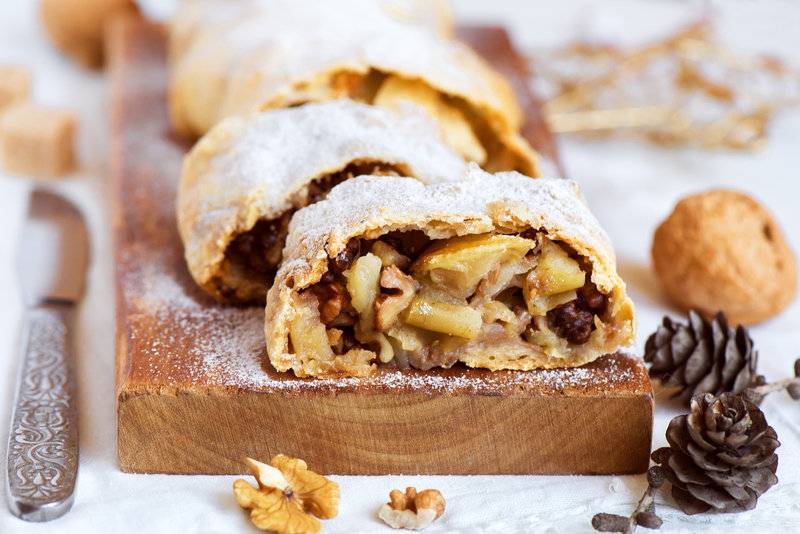 Ahh the Strudel, it's perfect anytime, but especially at Christmas. We've opted for a traditional apple filling here, but there are many wonderful variations ranging from sweet cherry, Christmas pudding, to Sicilian fig & spice. The pastry you choose is really up to you as ready-made puff pastry or short crust work beautifully, though serious cooks, may prefer trying their hand at the art of traditional strudel pastry which is “stretched” so thinly that you could almost read a newspaper through it. Which ever way you choose make it, we hope you enjoy creating your own Strudel tradition. frozen, ready rolled puff or short crust pastry, thawed. 2Melt Nuttelex over a medium heat and gently add breadcrumbs, the aim is to toast them in the pan. Once golden, remove from heat and set aside to cool. 3Next, mix cinnamon with sugar and stir through the cooled bread crumbs. Then again set aside. 4Soak raisins in the rum or luke warm water for 10-15 minutes, till soft. Then drain off the rum or water. 5Next, core, peel and slice apples and place in bowl with the lemon juice to prevent browning. Then very gently stir through the drained raisins (and chopped walnuts if using) and set mixture aside. 6Line a baking tray with non stick baking paper. Place the pastry on a lightly floured sheet of non stick baking paper. Dust lightly with flour and roll out to rectangle so the shortest edge is facing lengthwise. Then brush the left hand side of the pastry rectangle with half the melted Nuttelex. 7Next, sprinkle the breadcrumb and sugar mixture on the righthand side half of the pastry and pat down evenly. 8Now, take the apple and raisin mixture and spread over the bread crumbs on the right side leaving a 3 cm border around the edges. 9Now you should have a rectangle 1/2 filled with apple/breadcrumbs on the right side while the left is only brushed with Nuttelex. Now take the 3 cm border of the top and bottom of the rectangle and fold in onto the pastry. Then strating from the right side with the apple, gently roll the pastry into a log, and keep rolling until the end. Then gently roll onto your greased and baking paper lined tray with the seam side down. Brush with remaining melted Nuttelex. 10Bake for 40-45 minutes, when crust turns golden, it is ready. 11Let cool slightly before slicing. Serve with a dusting of icing sugar and add a dollop of cream, ice-cream or custard.